Black and white I am the STIG 1-inch Button Badges. As no one really knows who the tame racing driver is from the cult car themed TV show Top Gear it could be any of us. 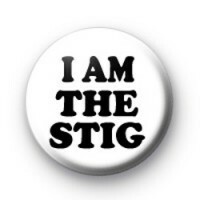 So if you want to own up to being The Stig then this badge could help you get your secret out. I think my dad thinks he is The Stig, although I am not convinced because he is no race driver.